1. Heat oven to 200C/180C fan/gas 6. Put the turkey mince in a large bowl, with the spring onions, cheddar and some seasoning. Mix well, then shape into 4 even-sized burgers. Chill for 15 mins. 2. Put the sweet potato chips on a large non-stick baking tray, and toss in 2 tbsp of the oil and some salt. Cook in the oven for 30 mins, turning halfway through. 3. Heat the remaining oil in a large frying pan over a medium heat and cook the burgers for 10 mins until golden. Turn over and repeat for the other side until they are cooked through. 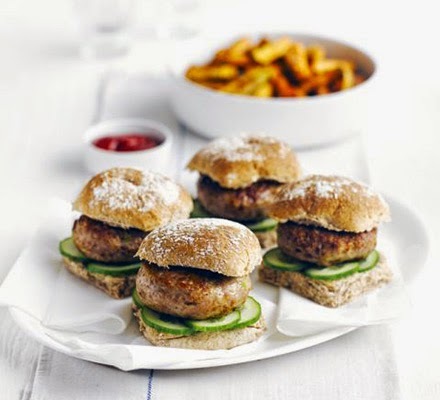 Split the rolls, place a burger into each with some sliced cucumber and a dollop of ketchup, and serve alongside the sweet potato chips and salad, if you like and good luck.